C2 Proficiency is the Cambridge English most advanced exam, for learners who have achieved an extremely high level of skill in the English language. The C2 Proficiency exam uses real-life situations that are especially designed to help you communicate more effectively and learn the language skills you need to function at the very highest levels of professional and academic life. More than 3,000 employers, universities and colleges, government departments and other organisations around the world rely on C2 Proficiency It is accepted wherever a high level of English language is required. 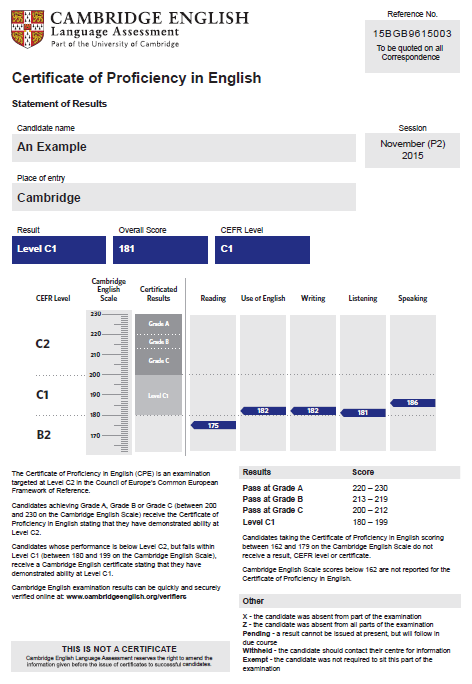 Scores between 162 and 179 are also reported for Cambridge English: Proficiency. You will not receive a certificate, but your Cambridge English Scale score will be shown on your Statement of Results. 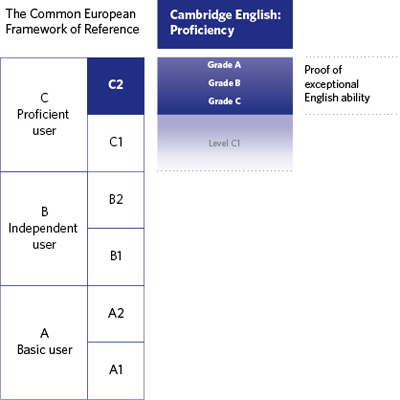 Please click on the image to the left of this text to find out the relationship between the CEFR levels, the Cambridge English Scale and the grades awarded in Cambridge English: Proficiency. If you achieve grade A, B or C in your exam, you will be awarded the Cambridge English: Proficiency certificate at Level C2. The place on the Web for Cambridge exam preparation! This website is for teachers or students of the Cambridge English: Preliminary (PET), First (FCE), Advanced (CAE) and Proficiency (CPE). It contains up-to-date advice about the Cambridge English exams, grammar, vocabulary and exam practice for students and extra classroom resources for teachers.